The Dividist let several auspicious dates float by without comment over the last week, including Earth Day, 4-20 Day and Tax Day. The latter is responsible for us missing the former. One date that we cannot let slip by is the six year blogiversary of The Dividist Papers (aka Divided We Stand United We Fall). We celebrate by reflecting on the journey as we paraphrase previous posts, plagiarize ourselves, and update some familiar themes and favorite topics. 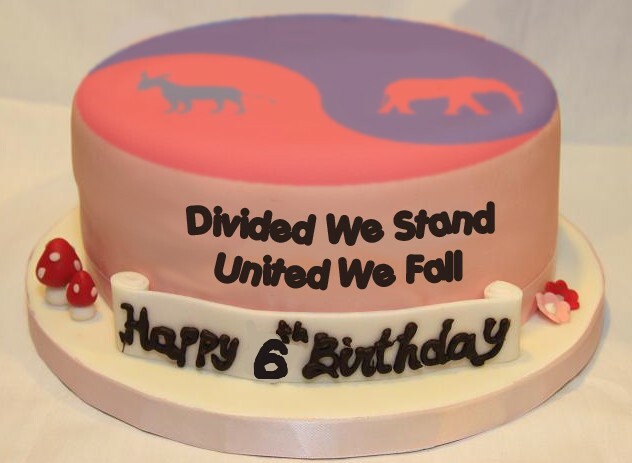 Six years ago today, the Dividist started this blog by asking the question "Is this blog for you?" As no one else was reading the blog at the time, the Dividist answered his own query saying "Probably not." Looking back on those first three posts from April, 2006 we take a certain perverse pride in offering a coherent and consistent thematic content from then until now. Then, we advocated a straight Democratic vote in the 2006 mid-terms in order to break the hegemony and consequent bad governance of Single Party Republican Rule [two trillion dollars expended in two unfunded decades-long nation building exercises in the Middle East]. Four years and two elections later we were advocated a straight Republican vote in the 2010 mid-terms to break the hegemony and consequent bad governance of Single Party Democratic Rule [two trillion dollars of new spending in two bills passed in pure partisan votes in just two years of One Party Democratic Rule]. In between we had two years of divided government, and again we now find ourselves in the midst of a divided government hiatus from those disastrous episodes of single party control pushing us toward the abyss of financial insolvency. Changing teams in support of a political objective is incomprehensible to partisans who are psychologically incapable of voting for anyone outside of the their preferred party for President, Senate, or House of Representatives. Partisans generally subscribe to the “My party is on the side of angels and the other party is the spawn of satan.” rationalization for tribal politics. Their vote at the federal level is as predictable as sunrise and sunset and they represent the vast majority of the electorate. Studies show at least 70% and probably closer to 80%+ of the electorate vote as rabid partisans in federal elections regardless of whether they choose to label themselves by their party of preference, or as an independent, or as a moderate/centrist. Most self-identified "Independents" are closet partisan voters. Not that there is anything wrong with that. Some of the Dividist's best friends are partisans. The correct way to to think of Partisan Dead Weight is as ballast - so long they stay roughly balanced on the right and left, they provide stability for our ship of state and keep it from listing too far to the port or starboard. If early polls are any indication, the Partisan Dead Weight in the 2012 election will be as as evenly split and balanced as we have seen in recent decades. It is because of them that a relative sliver of the electorate who are true independents, voters who will swing their vote at a federal level between the major parties, can decide the complexion and direction of our government. They just need an organizing principle so they do not cancel themselves out. 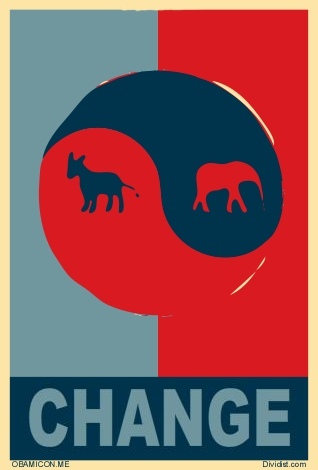 Until our political parties learn how to play nice with others, voting for divided government is a simple organizing principle that will keep both parties in check, force compromise, and yield centrist solutions. In this highly contested election year the Dividist will shoulder on and continue to push that divided government rock up the mountain. One more time. The problem is these darn presidential election cycles (1992, 2000, 2004, 2008), where the electorate exhibits collective amnesia and tends to give one party all the keys to the castle. If it happens this time, it is likely to be a return to Republican control. Hopefully the country has moved beyond this collective learning disability and will keep the government divided - at least until our leaders slow or turn our hell bound bus away from plunging off the fiscal cliff as we careen down the mountainside at breakneck speed. Our worst prediction over the history of this blog took place as we approached the debt ceiling "crisis" vote last summer. Based on the premise that our government only acts decisively and correctly when an imminent crisis forces them to act, and further assuming that we were staring into the financial abyss, the Dividist expected and predicted a "Grand Bargain" to be struck by our divided government leadership. We thought it would certainly happen either before the vote last summer, or with the formation of the "Super Committee" by the end of the year. We were wrong. Our leaders simply kicked the can down the road for another year. "...beneath the campaign noise, some elected officials and policy experts see improving odds for 2012 to end up yielding much more, including progress toward a deal on tax and budget issues that have confounded Washington’s divided government. ... two looming events — an automatic $1.2 trillion budget “sequester” hitting defense and domestic spending, and the expiration of all of President George W. Bush’s tax cuts — will create pressure for the two parties to strike a compromise. “The probability of a deal strikes me as pretty high, since no agreement would be such a disaster,” said Peter R. Orszag, President Obama’s former budget director. “There are multiple factors that could come up and cause this to fall apart,” said Ms. MacGuineas of the Committee for a Responsible Federal Budget. “But there’s one factor that keeps it together: Everyone knows it has to happen.” Whether Mr. Obama or Mr. Romney wins in November, “nobody should want to govern without this deal,” she said. “It frees space and time for the other parts of their agenda — besides having to save $5 trillion." The Dividist is All In. We are doubling down on last year's prediction. All we needed was a "real" crisis with a "real" deadline. Now we have one. We were not wrong. Our timing was off. We will get a Grand Bargain this year, under this divided government, that actually deals with the spending and debt. Really. We mean it this time. It will probably happen during the lame duck session, but maybe - just maybe - we might get it before the election. It could happen. And if true independent swing voters want to see this deal compromise struck somewhere near the rational center, the one way to be sure that happens is to vote to keep the government divided.